There’s a scene in an episode of The West Wing where C.J. and Toby are talking about the upcoming Presidential debate and CJ says to Toby: He’s not a little bit crazy? Toby replies: No… No… No… A little bit. That’s how I feel right now. Am I crazy? No. No. No. A little bit. LOLOL. 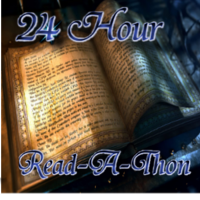 I was reading my pal Marq’s blog, and saw she signed up for Dewey’s 24-hour Read-a-thon. I heard about it too late to participate last year, so I watched the insanity fly by and thought it looked like fun. I tried, I really did, to remember about the Read-a-thon, but I had completely forgotten. Once Marq reminded me, however, off I went to sign up. Not sure what books I’ll be reading. I’m actually leaning towards not pre-selecting at all. I read more when I’m reading books I’m in the mood for, and who knows what I’ll be in the mood for in a month. And bonus? This will help me catch up on my Goodreads challenge of 251 books read this year. For more information, or to be a little bit crazy like us and want more info, there’s a FAQ page HERE where you can get more details and helpful tips and suggestions from previous years. Oh, and you don’t need a blog to participate. You can use Twitter, Facebook, Flickr, etc. There are mini-challenges and lots of prizes, so you all should really think about joining in. We’ll also need cheerleaders, and you can sign up to be a cheerleader by going HERE for more info. Yay for cheerleaders!